LETTERS TO THE WORLD is the first anthology of its kind—a feminist collaboration born from The Discussion of Women’s Poetry Listserv (Wom-po), a vibrant, inclusive electronic community founded in 1997 by Annie Finch. With an introduction by D’Arcy Randall and brief essays by the poets themselves reflecting on the history and spirit of the listserv, the book presents a rich array of viewpoints, and poems ranging from sonnets to innovative forms. Click on the underlined links to order: Amazon. Also available from Red Hen Press; currently their website is being updated. A new Red Hen link will be posted when avaiable. Panoramic in scope, these Letters to the World and from the world of the on-line Wom-Po Listserv exult in a constellation of voices both individual and now connected. I can’t help but think of Emily Dickinson, whose line provides the title for this anthology, privately binding her poems with needle and thread and storing them away. 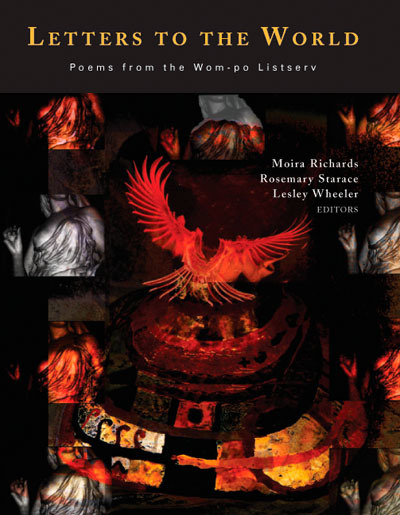 It’s a gift that we have these poems available from a community that is passionate about poetry and women’s voices. It’s a conversation in which we should all be engaged. It’s a new cosmos. Imagine if Dickinson had been able to log on. LETTERS TO THE WORLD is unique on several levels. Its poems convey the extraordinary range of existing contemporary voices and show how the Internet allows people to connect meaningfully across cultural and aesthetic boundaries. The preface, introduction, and 28 brief essays by contributors meditate on this quality of Wom-po and reveal how virtual communities enlarge real lives and both deepen and broaden poetic discourse. The diversity of the poems and the poets’ demographics, the self-empowering means of selection, and the egalitarian process which brought the book into form make LETTERS TO THE WORLD a remarkable example of how the Internet has radically rearranged associations among poets, editors, and readers. Download pdf of “Cento for an Anthology of Women’s Poetry,” an article on the process of creating the book, from Junctures: The Journal for Thematic Dialogue. Read the text from the 2008 AWP Panel on LETTERS for another discussion of the book and its process. EDITORS: Margo Berdeshevsky, Rachel Dacus, Ann Fisher-Wirth, Ellen Goldstein, Eloise Klein Healy, Ann Hostetler, Louisa Howerow, Lillian Baker Kennedy, Athena Kildegaard, D.O. Moore, and Ren Powell. • See column on LETTERS and Wom-po here. all content by Rosemary Starace is licensed under a Creative Commons Attribution-NonCommercial-ShareAlike 3.0 Unported License.